In legend, Robin Hood was a famous outlaw who was said to rob from the rich to give to the poor. Traditionally dressed in green, Robin would ply his trade in Sherwood Forest aided by his band of merry men. Bally have taken the famous legend and given it a twist – Robin Hood is now a female character, who is every bit as good with the bow as the male character ever was. Joining Lady Robin on the reels are a series of weapons and varieties of gold which she has picked up in her work. The highlight of the Robin Hood slot machine is certainly the free spins bonus rounds. Arrows are fired and if the right targets are hit, whole reels will be come wild. Wild reels mean big cash, so you’ll certainly be able to follow in Lady Robin’s footsteps. Available in both a live casino setting and online, this Bally design can be played by all. Lady Robin Hood is a five-reel slot, which shows four symbols on each reel when the spinning stops. The game has a total of 40 win-lines which pay from left to right, with each spin costing 40 credits. As you might expect, Lady Robin Hood herself is the highest paying symbol in the game. Land the attractive outlaw five times in a row on one of the 40 win-lines and you’ll pick up 500 coins. Lady Robin Hood is stacked throughout the game, so if the stars align you could see the reels filled with the character. The quiver of arrows that Robin carries on her back is next on the pay table, worth 375 coins for the maximum five in a row (the same pay out for landing Robin 4 times in a row). Also paying 375 coins are a golden blade with its sheaf and golden goblets which have been taken from the rich. A small bag of gold and silver coins have a top prize of 250 coins. Completing the standard symbols are the playing cards 9, 10, J, Q, K and A. Each of these symbols has the same top prize as the money bag at 250 coins. The wild symbol is set against a wooden background, with an attractive red pattern forming at each of the corners. This wild symbol appears on reels 2 through 5 and will substitute for any other symbol in the game apart from the scatter. As some spins begin you might find yourself landing the randomly awarded ‘Arrow Mystery’ feature. Arrows will fire between 2 and 8 wild symbols onto the reels, which give that particular spin fantastic winning opportunities. The free games bonus feature is activated when you land the bonus symbol on reels 1, 3 and 5. You’ll immediately be awarded with 2x your total stake, as well as given 10 free spins to play with. Above the reels you’ll find a target which arrows will be fired at. Each section of the target applies to a different reel. Above each reel you’ll find a shield, and to break down the shield you’ll need to land four arrows in the appropriate part of the target. When the shield has been breached, the entire reel becomes wild for the rest of the feature. You’ll be awarded three arrows at the start, as well as an arrow every time a target symbol appears on the reels. The Lady Robin Hood slot machine design plays out against the backdrop of the forest, with the sound of birds in the air. Lady Robin herself cuts an attractive figure and is the standout symbol on the reels. Check out the excellent graphics when the arrows come into play in both of the features too. If playing Lady Robin Hood at a live casino, you’ll be impressed by the large curved screen, which gives this game added depth. The online version has appealing clear and crisp visuals. 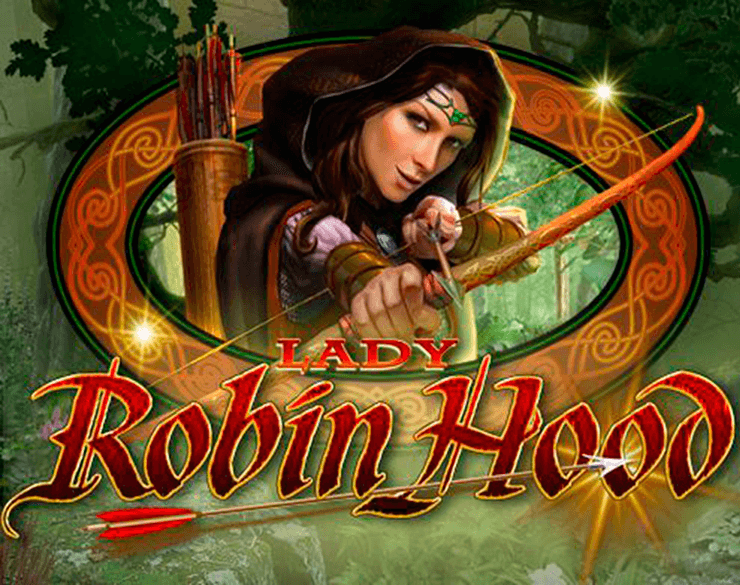 Lady Robin Hood is an enjoyable and immersive game from Bally. With a slightly oversize reel-set, the base game offers more winning opportunities and therefore more excitement. With the added ‘Arrow Mystery’, those large multi-line wins are only ever a spin away. The bonus feature is excellent. Hit the right targets and those all wild reels will make for mega wins – a feature that becomes more involving with every spin. Win big and you can take it from the floor and give it to the poor!